We take pride in providing you with the best. Dr. Osborne has truly established a high standard of patient care with a modern, “technology-integrated practice”. We use a specialized digital camera on a microscope to record and help diagnose conditions affecting the external structures of the eye including the lids, conjunctiva and cornea. “NO AIR-PUFF” technology. High eye pressure is a risk factor for the progressive neurologic condition known as glaucoma. By utilizing a retinal camera in his examination, Dr. Osborne uses technology which provides a comprehensive view of the back of the eye. We recommend that all our patients elect to have this test. The visual field test (threshold computerized perimetry) provides information that no other test can. 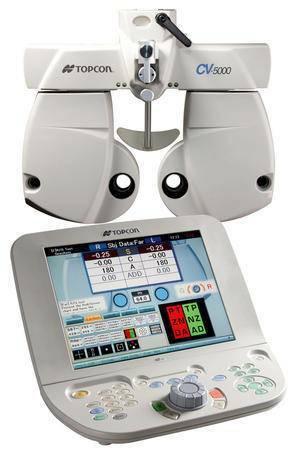 Corneal topography is the most accurate tool for mapping the surface curvature of the front of the eye. A specular microscope is a high resolution, computerized microscope that visualizes individual cells called endothelial cells that line the back of the cornea. Optical Coherence Tomography (OCT) is a non-contact imaging technology similar to an MRI. It uses low energy reflected laser light to produce highly detailed cross-sectional images of the eye.